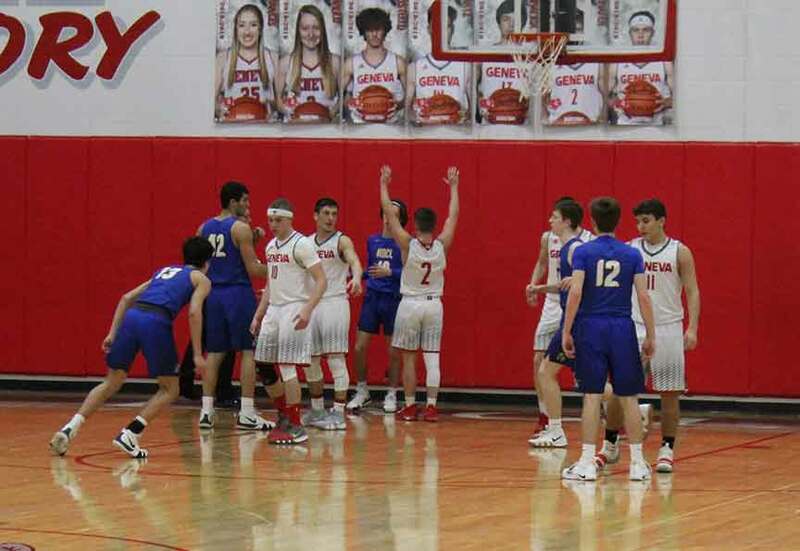 GENEVA – The Geneva Eagles boys’ basketball team won their Division II sectional basketball game over the visiting Notre Dame-Cathedral Latin Lions on Tuesday, Feb. 26. The Eagles won the game 63-45 to advance to face the Harvey Red Raiders in the sectional final. Geneva used a 22-7 first quarter lead to help propel them to the big win. The Eagles had a balanced attack in the opening quarter as Nick Stoltz led Geneva with eight points. Brandon Smith, Vinnie Varckette and Grant Mihalick each added four points. Dakota Harvey also had a basket for the Eagles in the opening quarter. Dan Martin led the Lions with five points in the opening quarter. Don Gatto scored the only other two points in the first for NDCL. NDCL kept Geneva in check in the second quarter as they were able to trim the lead to 33-21. Grant Mihalick led the Eagles with five points in the second quarter. Dawson Schafer added four points and Brandon Smith chipped in a basket. Dan Martin and Dane Berschig each scored four points for NDCL in the second quarter. Frank Martin, Ben Szabo and Don Gatto combined for the other six points. Geneva got back on track defensively in a low scoring third quarter as they outshot NDCL 11-9 The Eagles took a 44-30 lead into the fourth quarter. Geneva went on to outscore NDCL 19-15 in the final quarter for the 63-45 win. Grant Mihalick led all scorers with 17 points. Nick Stoltz added 12 points and four assists in the win. Rounding out the scoring for the Eagles were: Dawson Schafer seven points, Blake Peet seven points, Vinny Varckette seven points, Dakota Harvey seven points and Brandon Smith six points. Dan Martin led NDCL in the loss with 15 points. With the win the Eagles improved to 14-8 on the year, while the Lions fell to 6-17. Pictured: The Geneva Eagles hosted the NDCL Lions in recent Division II sectional game.